The possibility of using computers to create immersive virtual environments in which one can interact with others has excited the imagination for decades, particularly in science fiction works like William Gibson’s Neuromancer, films like TRON (1982), text-based games like Zork, MUDs (and their many variations), the holodeck in Star Trek: The Next Generation, and in networked adventure and first person shooter videogames, such as World of Warcraft and Quake. Generally, games allow a limited range of options for modification (“modding”) and limit the type of interactions, keeping players focused on the violent “shooting” aspect. Second Life was launched in 2003 as a virtual space for users to explore using their customizable avatars, create landscapes and objects with 3D modeling tools, program behaviors onto these objects with their scripting language, and interact with any of their (currently) over 1 million users. As such, this is a creative space which has inspired writers like Alan Sondheim and others to use it as a platform for writing and artistic performance. “Trope” is a location you can visit in Second Life— and I recommend creating the free account, downloading the software, and experiencing it on your own— but viewing the machinima will provide a good sense of its approach and practices. One of the fascinating things about this island full of stories and poems is the variety of forms they take, such as a line of dominoes with a word in each piece, or a book inside of a cabin inside of a snow bubble that is floating in the air. What does it mean to read such a book in such a context? 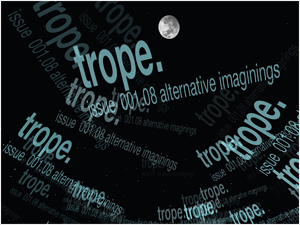 Editor’s note (04/25/14): Trope is no longer available as a location in Second Life. For a discussion of the challenges of archiving Second Life “islands” read the Preserving Virtual Worlds final report. “Screen” by Noah Wardrip-Fruin, Josh Carroll, Robert Coover, et. al.